Two wheel barrows of cow dung is enough for a family in Cameroon to cook all the food they need for an entire fortnight. Biogas chambers are a simple but very effective technology being demonstrated by Village Aid as a part of our project reducing conflict and promoting better use of natural resources in North-West Cameroon. Biogas is a renewable gas that is produced by organic matter when it decays. The aim of biogas technology is to harness this gas so it can be burnt. 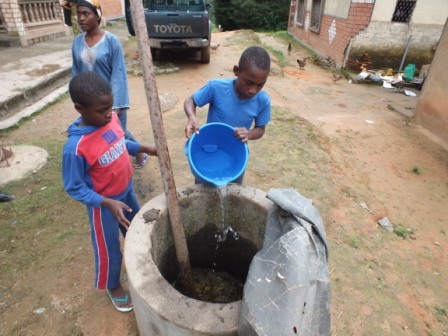 Village Aid have been working in partnership with the Cameroonian Human Rights organisation, MBOSCUDA to develop and install Biogas chambers suited to life in North West Cameroon. One year in, the results we’re seeing are fantastic. Here is a simple step by step guide. 1. Cow manure is mixed with water in a concrete cauldron. 2. This mixture runs down into a large tank where it decays. 3. 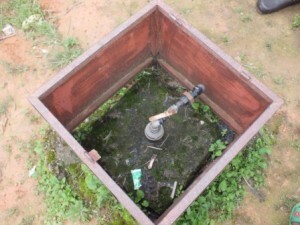 As it decays, biogas rises to the top of the tank and out through a pipe. 4. This pipe runs from the tank into a house and connects to a gas stove. 5. Which the family can use to cook their dinner on! There are many other benefits of this system for communities. Most households currently cook on wood and therefore villages have very few trees left. Some families have had to start buying wood or walk long distances to find it. Wood collecting can disrupt people’s lives making children late for school and women have less time to do other things. Smoke from wood is very harmful to eyes and lungs over time, whereas biogas is virtually smoke free. The slurry that comes from the digester is an excellent fertiliser for crops and is collected to be shared with neighbouring crop farmers. Evidence of smoke damage from wood fires all the time can still be seen on this house. Village Aid’s programme has also been tackling the difficult conflict between the grazers of cattle and the farmers growing crops. Much of this conflict has been due to limited natural resources such as firewood. 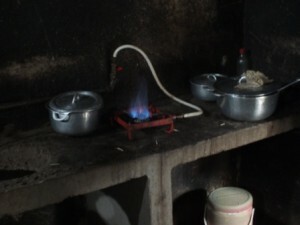 Biogas is a very helpful solution to reduce this conflict and so far seems to be working well. With 7 sites constructed in North West Cameroon in 2015, we’re already seeing the impact this simple technology can have on rural communities. There are reports from all beneficiaries of improved health, fewer respiratory problems from smoke inhalation, eyes no longer sting, cooking is quicker and there is more time for other activities. With 7 more sites being built in 2016 we’re hoping the technology will inspire many other people in this area to be motivated by this and install their own biogas systems. We’re hoping that in the future many more communities can use the biogas systems to contribute to more sustainable livelihoods, improved health and a reduction in natural resource conflict. If you would like to find out more about this project, leave us a question below, call us on 01629 814 434, or read more about our work here. I think this project needs to be implemented in Uganda, so that we can save the trees that are being cut on a high rate.Many zero grazing farmers are not using cow dung for other uses other that Manuring. 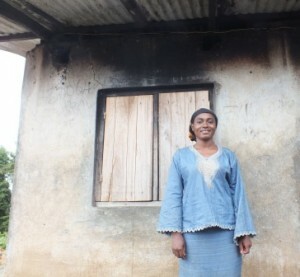 Biogas can help those who don’t have source of firewood. Yes Timbyetaho it is great. We worked with organisations that specialize in Biogas to implement it in Cameroon. If you’d like further information please email us on info@villageaid.org with some more information and we may be able to put you in touch. This is a very good stuff and I would like to be introduce and educated properly how the cow manure bio-gas is done so that I can do one for myself to help cook for my Pre-School Children and house use as well. Thanks for getting in touch. Biogas is a fantastically simple technology! Please email info@villageaid.org if you’d like any further information on this. This is wonderful simple technology which could help save our forest which is fast dissappearing and equally save rural and urban poor women from firewood smoke caused illnesses. Please, kindly provide me with more information on how we can implement this in our project area as an organisation working with women and young farmers. PREVIOUSAn A-Maize-ing impact on Maize crops thanks to Alliance Farming in North-West Cameroon! NEXTGet to Know Village Aid: Meet Michelle our UK office volunteer.